for 2018-19 Honda GL1800 Gold Wing. Available in Electropolished Stainless Steel or Black Powdercoated steel. Available in three sizes and two tints. for 2019 Yamaha® 900 Tracer/Tracer GT. Available in three sizes and tints. Why Buy a Motorcycle Windshield? Decreasing wind blast reduces riding fatigue. 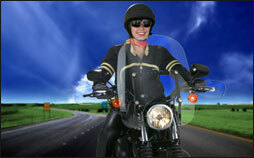 Motorcycle windshields can also help combat back pain and arm strain, as well as shield you from certain debris. How Do I Get the Right Fit For My New Motorcycle Windshield? 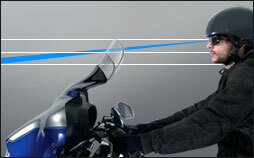 Height is a preference, but the recognized standard is to be able to look just over the top of your motorcycle windshield to see the road ahead at a distance of 50 feet. How Does Hardcoating Improve Motorcycle Windshields? 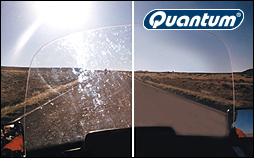 National Cycle’s exclusive Quantum® hardcoating is the state-of-the-art in motorcycle windshield scratch resistance and optical clarity. How good is it?